Back in 2014, David Cameron, the then Prime Minister of the UK, made an impassioned speech in which he begged Scots to reject independence, in favour of a new style of relationship between Scotland and the United Kingdom. Cameron said that there was a "patriotic vision" for a "strong Scottish nation ALLIED to the rest of the United Kingdom." However, four years later, the Secretary of State for Scotland has admitted that this was never going to be viewed as a partnership. "Scotland is not a partner of the United Kingdom," he said, adding "Scotland is a PART of a United Kingdom." So according to Mundell, Scotland should simply know her place, and be seen and not heard. 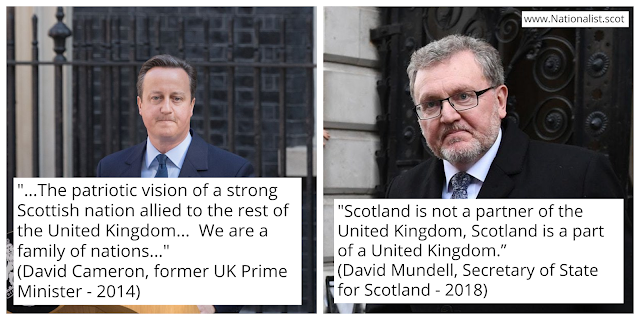 Scotland's explicit interests are of no interest to the UK Government according to Mundell - a clear sign that the tone has now changed, and that the false promises of 2014 were never going to be kept. Scotland was offered federalism, more powers, more sovereignty over her own affairs. These vague promises turned out to be a pack of lies. Theresa May denied Scotland a 2nd independence referendum, despite a clear mandate for that being delivered at the most recent Scottish Parliament election - which delivered a large pro independence majority - quite an achievement in a Parliament which was designed NOT to allow a nationalist majority. Scotland also had a much larger pro independence majority delivered at the most recent snap election, with the SNP winning a massive 35 out of 59 Scottish seats at Westminster. The mandate for a 2nd independence referendum is quite clear - and even a Scotland in Union poll last week could only find 35% who said they don't want another independence referendum - a bitter blow to the unionists who have tried to peddle the outright lie that Scotland is against having another say. In fact, a large majority prefer that that referendum should take place BEFORE 2021 according to that unionist poll. There was cross party support in the Scottish Parliament recently to reject the Westminster power grab - legislation passed by UK Government to block EU powers being handed to Scotland after Brexit. The legislation was passed in the House of Commons, in a matter of minutes, without even allowing a single Scottish MP to say a single word on the matter. The Brexit referendum produced a massive remain result in Scotland, when Scots voted almost 2 to 1 to remain a full member of the European Union, yet Theresa May has continually denounced the suggestion that this is a constitutional crisis of mass proportions, that an entire country could have it's EU membership revoked despite massive support for continued membership. May insists that the time for an independence referendum should only be considered after a deal with the European Union has been done. May has presented a deal that would mean continuing to be bound by European rules, but without having a say over these rules - another democratic deficit of mass proportions. Even Brexit secretary Dominic Raab has admitted that we would be better off remaining in the EU than accepting Theresa May's deal. However, there are rumours now surfacing that MPs and Ministers within Theresa May's cabinet may have already been offered golden handshakes in return for support of her terrible Brexit deal. Knighthood's have already been awarded to Cabinet members, who are said to be backing May's deal. How many more knighthoods will be offered? How many more special deals are being made behind closed doors to ensure that May's deal passes through Parliament? It is absolutely reprehensible that in this day in age, that the government of a country that portrays itself as a democratic state could use such underhand tactics to sign us up for massive constitutional change that seeks to undermine democracy and cause massive economic damage. Scotland has been treated with such contempt during this process, that the idea that there remains a positive case to be, as Mundell put it "a part of a United Kingdom" is simply laughable at this stage. The more the British government drag their heels and try to prevent the people of Scotland from having a say on the future of their country, the more that UK Government blocks the democratic will of the sovereign people of Scotland, the more that support for independence will grow.